A fateful message we received from consultant Mark Witton, which helped set this redesign in motion. In August 2017 we began an effort to redesign our T. rex. Little did we know that it would become a year-long affair. We are proud to present our results: what we believe to be the most accurate Tyrannosaurus rex reconstruction ever. Here’s a look into the design process and research that went into this massive project. With the goal of creating the most accurate Tyrannosaurus rex reconstruction to date, we wanted to start from the ground up. The majority of the skeleton was designed to be generic, looking at the features of many specimens in an attempt to recreate an average specimen of the animal. RJ is in possession of a 3D printed skull of Stan (BHI 3033) from a 3D scan of the original material; this served as the basis for our skull. We chose Stan because its skull is generally considered to be the least distorted Tyrannosaurus rex skull available. That being said, the teeth were placed back in their sockets properly in the illustration. The gastralia were particularly difficult to reconstruct. As gastralia are infrequently used in mounts, it was difficult to understand them in a three-dimensional form. With help from Scott Hartman, RJ was directed to this photo of gastralia preserved in matrix. Scott Hartman recommending we de-beef those arms. 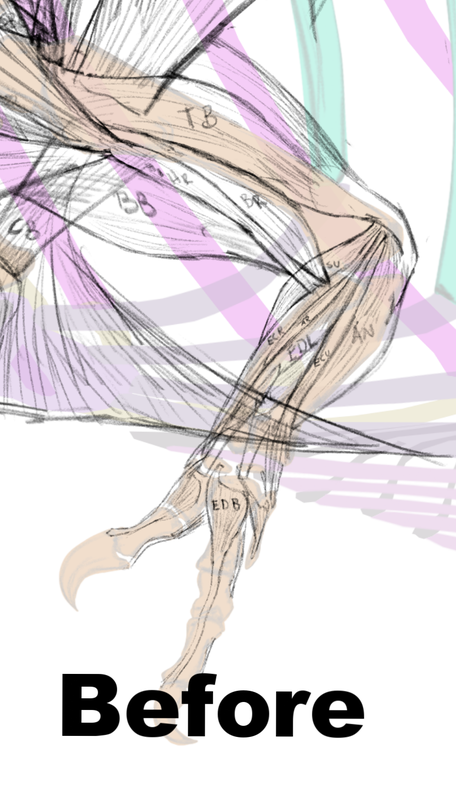 A major goal of this project was to reconstruct every muscle. We believe this to be the most in-depth anatomical recreation of this animal. Countless hours were spent by RJ in an effort to read, understand, and implement numerous papers’ information. Muscles were drawn, redrawn, and sometimes redrawn again—all under the guidance of Scott Hartman, who we believe to be the leading expert in the field of muscular restoration for dinosaurs. During the the course of this project we have received some criticism for the thickness of the arms. It was RJ’s first instinct as well to give this fella beefy arms. Above you can see Scott Hartman’s feedback about the thickness of the arms before toning it down. One caveat to consider is that no one knows exactly what these arms were used for, or whether they may have been very atrophied in life. We pushed the muscular thickness about as far as we reasonably could given the data we have. If you are interested in the literature cited during the creation of our T. rex musculature, they are listed at the end of this page alongside those used in this blog post. The first difference that many will notice about our new T. rex is that it lacks feathers. In 2017, Phil Bell & colleagues published a study on the skin covering of Tyrannosaurus rex. In this paper, Bell et al. presented evidence against the theory that all tyrannosauroids were feathered, a notion that us and many others had followed. The paper had some fairly convincing evidence; most notably, the paper offered published skin impressions of Tyrannosaurus rex for the first time. These impressions came from multiple areas of the body (see graphic), all of which showed very small reticulate scales. This was in contrast to the giant tyrannosauroid Yutyrannus, described in 2012, which preserved only feathers. The main opposition to the conclusions of this paper have been taphonomy-related, ie. perhaps the feathers just weren’t preserved and were present on other parts of the body, or even on the same part of the body over the scales, or perhaps these aren’t scales at all but just textured skin. We do not find these options to be the most parsimonious conclusion for several reasons. If an animal preserves several impression from several parts of the body that all show the exact same pattern (as in T. rex), and close relatives also show the same pattern from different parts of the body (as in tyrannosauridae), then the most parsimonious conclusion is that this pattern covers the whole body. Suggesting that the other parts of the body lacking impressions (of which there are very few) might have had feathers struck us as a “god of the gaps” argument in relation to universal origins. Defaulting to the classic Occam’s razor heuristic, the most parsimonious explanation was simply that the whole body was covered in scales. To quickly address the idea that the scales are actually textured skin: we haven’t ruled this option out, but we feel parsimony also comes into play here. These structures look very much like the reticulae and small scutella we see on the feet of birds and well, if it looks like a duck… We would be more concerned with the taphonomy argument if we were getting these isolated scale-like impression from other North American coelurosaurs, but we aren’t. In fact, in recent years we have obtained several beautiful ornithomimid specimens from similar sediments that preserve extensive impressions of feathers. To put it simply: these arguments feel a little too much like wishful thinking for our liking, and in our opinion the most parsimonious explanation is that tyrannosaurids were covered in reticulae or small scutella. In addition to the physical evidence for reticulate scales, there is also a biomechanical argument to be made. One of our major consultants on this reconstruction, Scott Hartman, has been conducting physiological modelling on early dinosaurs and other reptiles, including quantifying thermal constraints (Hartman 2015, Hartman et al. 2016). He is not working specifically on T. rex, but his research has implications for its potential feathering. According to his research, depending on ambient temperature, animals stop receiving any benefit from dermal insulation at somewhere between 1 and 3 tonnes. Due to the costs of producing such integument, this may cause these traits to be selected against, as has occurred in many large mammals and fur. Looking at the skin evidence from the rest of the dinosaur family tree, this shouldn’t be that large of a surprise. If we assume that filaments are basal to all dinosaurs, then they have already been lost at least 4 times prior to tyrannosauroids: thyreophorans, cerapods, sauropods, and ceratosaurs. This makes feather loss in one additional clade hardly a stretch of the imagination. Occasionally, it has been suggested in the literature that juvenile tyrannosaurids may have had feathers which they shed in favour of scales as they grew. While not technically impossible, we have not opted to explore this idea as no animal, living or extinct, is known to do this. Where do you start when designing the color pattern for a giant? In the past we have, perhaps too often, looked to colorful birds, lizards, etc. for our color guides. A major issue with doing that for an animal like Tyrannosaurus rex that those colorful animals are often very small, or of very different environmental niches. Of course, then you run the risk of troping the dull, elephantine giants from outdated paleoart. There was great care put into this design to achieve a middle ground. A naturalistic pattern that would be applicable to a tyrant, but not overly dulled-down and boring. Animals like giant extant crocodilians and komodo dragons became very helpful in understanding the relationship of color and patterns to large reptilians of the past. There were, of course, a couple of specific animals that served as chief inspiration for some of the color choices, but to this day no one has guessed them correctly. One of the two papers published last year that spurred us to rethink our design was the description of Daspletosaurus horneri (Carr et al. 2017). This study argued that we can predict the skin types present on the skull of tyrannosaurs by examining the traces left on the bones (osteological correlates). For Daspletosaurus (a close relative of T. rex), Carr et al. predicted a keratin sheath covering the post-orbital hornlet, “armour-like dermis” on the top of the snout, and “large, flat scales” on the sides of the skull which housed sensory structures like those of crocodilians. The publication does not anywhere mention the status of extra-oral tissue covering the teeth (informally “lips”), though it is frequently cited as stating their absence based on interviews with Thomas Carr. Neither us nor our consultants found these arguments particularly compelling. An immediate problem with Carr et al.’s suggestions is that crocodilians do not, in fact, possess “flat scales” on their skulls at all. Croc heads are actually covered in a solid surface of hard skin which cracks and fractures as the animal grows, giving it the scale-like texture (Milinkovitch et al. 2012). These structures are likely integumentary in origin due to the tight relationship between the overlying skin and bone in this area. This bizarre structure seems to resemble the structure present under large ornamental scales on some lizards, and predicted on Ceratopsians (Hieronymus et al. 2009). We therefore conclude that large, ornamental scales were also present over this area in Tyrannosaurus, and have reconstructed our animal accordingly. Our Tyrannosaurus also shows some keratin plates on the back of the neck. This is a purely aesthetic choice on our part, but one we consider reasonable; many birds with heavy keratin on the head show some migration of this structure back onto the neck, so this is by no means a flight of fancy. Tyrannosaurus showing keratin sheath on the orbital horns, padded scales on the nasals, large ornamental scales on the maxilla, & immobile extra-oral tissue. Something that has not changed about our Tyrannosaurus (but still sparks questioning) is the presence of extra-oral tissue on the jawline, which conceals the teeth when the mouth is closed. The current evidence (primarily from the thesis of palaeontologist Ashley Morhardt) suggests the likelihood of some kind of soft tissue covering the teeth and creating a "seal" when the mouth is closed. This is indicated by the pattern of foramina (small holes in the bone that supply nutrients to the soft tissue) on the fossilised jaws of these animals and comparisons with living animals. Morhardt’s research shows a correlation between foramina count and oral tissue type. >50 foramina generally means large, mobile, fleshy structures; 50-100 means immobile oral structures and >100 means no oral structures, like crocodilians. Tyrannosaurs fall in the 50-100 range, which leads us to conclude that immobile, fleshy soft tissue is most likely (think lizards and tuataras). Living dinosaurs (birds) and their closest relatives (crocodiles) do not serve as good comparisons, as they are both extremely specialised at what they do and show morphology that does not appear until late in their evolution, meaning something different was present in their common ancestor. For those after a more detailed summary of the topic, we highly recommend Jaime Headden's blog post on the topic. The bird-like arrangement of scuta, scutella and reticula on the metatarsals and toes on our Tyrannosaurus are based on the allosauroid Concavenator, which is currently the only non-maniraptoran theropod with extensive impressions on the feet, and on modern large ground birds. “Concavenator has the same arrangement of the integumentary structure as the podotheca of extant birds (reticulate, scutate and scutellate scales) differing from those of extant crocodiles and sauropod dinosaurs” (Cuesta 2015). Cuesta et al. suggest that this structure is basal to avetheropoda, and replaced with feathers in some taxa. The shape of the foot pads on our reconstruction is based on footprints from the Hell Creek formation that can be reasonably ascribed to T. rex (Bryner 2007). Special care was given to designing the keratin sheaths of the claws. As seen in the images below, the keratin extension is roughly minimum 1/3 longer than the bone core. The feet claws, unlike those of modern birds of prey, would have been worn down the tips of the claws — not unlike those of ostriches. Inversely, the claws of the hands would likely see much less contact, and would preserve a very sharp tip. “Over a year ago RJ Palmer contacted me because the Saurian team had made the hard decision to completely overhaul their T. rex model in their game. The impetus was recent research that suggested that the largest tyrannosaurs either lacked feathers, or had minimal coverings. But they didn’t simply want to reskin their model with scales, they wanted to rebuild the model from the ground up to get every detail right. They worked from the skeleton up, spent months getting the muscles right, and the results are now available for everyone to see. Hopefully, this blog post has answered any questions you had about our rationale/process behind this decision satisfactorily. If not, we always welcome further discussion on our Discord channel. We’re extremely grateful to all the experts that helped us, and are really encouraged that so many in the community have taken an interest in the details involved. Morhardt, A., 2009. Dinosaur smiles: Do the texture and morphology of the premaxilla, maxilla, and dentary bones of sauropsids provide osteological correlates for inferring extra-oral structures reliably in dinosaurs?